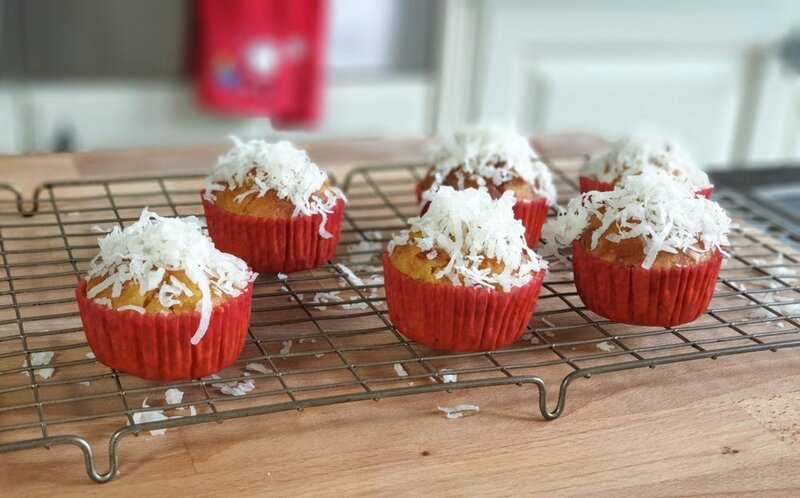 Yummy muffins… yes but, super fresh and healthy delectables! I give that the two thumbs up. I love experimenting with different healthy ingredients, my goal is always to find the balance between sweet, natural, fluffy, light and healthy. Everyone is drawn to that big tempting muffin displayed in the coffee shops whispering to you: “buy me”. But what if I tell you that the calorie content packed in each takes up to a quarter of your daily calorific intake? Do I have your attention now 😊? Baking muffins are easy and take no time to prepare, check out my blueberry and cinnamon swirl ones. You can even turn my apple crumble cake into muffins and bake 25 minutes. The beauty of home baking is that you have the upper hand to control what goes in and quantities. Come on, there is nothing like biting into a freshly baked warm, soft, squishy and natural treat. Less guilt equals a happier mood. What else can we ask for! Preheat oven to 180C fan setting. In a bowl sift the flour, baking soda and baking powder and set aside. In another bowl add the vegetable oil, eggs, sugar, salt and applesauce. Whisk together then add the crushed pineapple, shredded carrots, raisins, coconut flakes and walnuts. Whisk then add the grated nutmeg. Fold in the flour and incorporate it well. Scoop the batter into a cupcake case lined medium muffin tray and bake on the middle shelf for 20 to 25 minutes or until an inserted toothpick comes out clean. When ready take the muffins out of the tray onto the cooling wire rack. Once cooled, coat the surface with any Jam you fancy as this will help the shredded coconut stick as a topping. Always use applesauce in a cake as it adds moisture to the final texture. This is a thick batter so don’t over mix it. You can opt for not adding any cane sugar for natural fruit sweetened muffin. These muffins can be stored in a sealed container for 2 days and frozen for up to 3 months in a Ziplock bag, simply thaw and eat. Per Serving: 216 Calories; 13g Fat (52.8% calories from fat); 3g Protein; 23g Carbohydrate; 1g Dietary Fiber; 30mg Cholesterol; 230mg Sodium.